When discussing the Navy’s top science and technology (S&T) priorities with military, government and industry leaders, Chief of Naval Research Rear Adm. Mat Winter reflected on his college days at the University of Notre Dame. 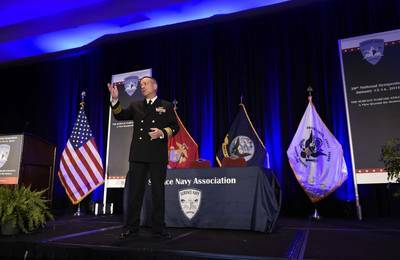 On Jan. 13, Winter gave the keynote address at the Surface Navy Association’s 28th Annual Symposium, held in Crystal City, Virginia. The symposium featured defense companies, suppliers and military commands exhibiting surface warfare technology and future research and development initiatives.